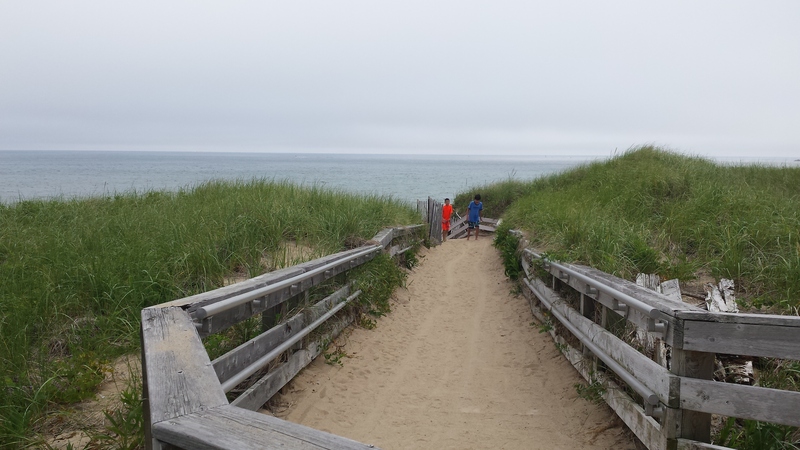 Salisbury Beach State Reservation - Salisbury, MA - Take a day trip! 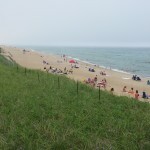 View of the Ocean Beach at Salisbury Beach State Reservation. Playground – next to the beach and available for use by day-trippers and campers. Picnic and Grilling Area – with picnic benches and charcoal grills. Pavilion – this area includes many picnic tables. Bathrooms, Changing Facilities and Showers – there are multiple areas to wash up after a day on the beach. Camp Store – The park has a store in the middle of camping area. Nature Trail – There is a short trail running behind the camping area up the Merrimack River for a small stretch. Hunting is also allowed in season in limited parts of the park and in the adjoining Sandy Point State Reservation. Fees for use of the park for the day are $14 for cars with Massachusetts plates and $16 for everyone else. 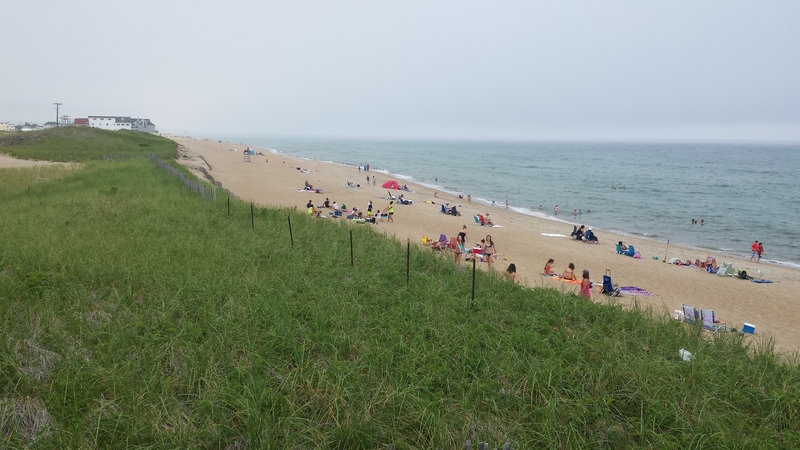 Campsites can be reserved online at Salisbury Beach Campsite Reservations and a night is $22 per site for Massachusetts residents and $27 for out of state residents. Electric Power and Water hookups are available for additional fees per night. Salisbury Beach is accessible from Route 1A and convenient to Routes 95 and 495. Exit 58A from I-95 will put you onto Route 110 East – turn right onto Route 1A and the park entrance will be on your left. From I-495 take exit 55 for Route 110 and take the same right onto Route 1A and the beach will be on your right 2 miles down. For those using a GPS device to navigate any address on State Beach Road in Salisbury, MA should put you onto the access road and the following coordinates mark the turn from Route 1A onto the main road into the park: 42.841880, -70.823198. 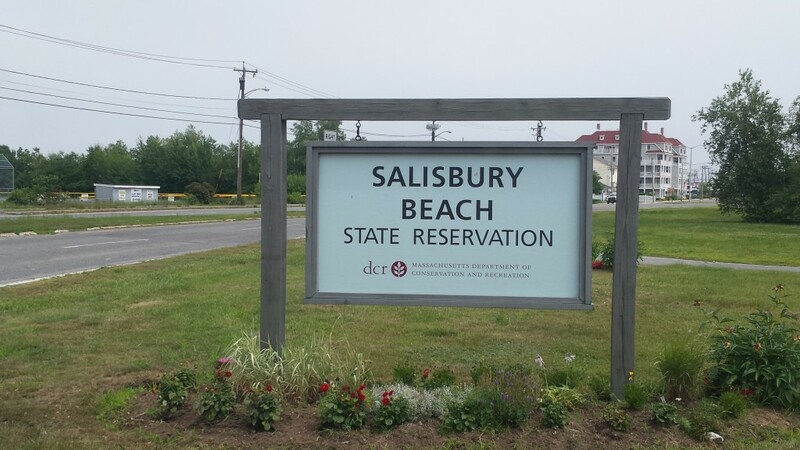 This sign marks the entrance to Salisbury Beach.